Target Investment Opportunities PLC, the investment fund controlled by Oaktree Capital, has recently acquired Navan Retail Park for a price of €11.5m. The retail park generates an annual rental income in excess of €770,000 and comprises over 11,000 sq m of retail warehousing with significant expansion opportunities. “We are delighted to announce the acquisition of Oaktree’s first major retail asset in Ireland and we are actively seeking other similar opportunities. Oaktree have already been very active in the Irish office, residential and student accommodation sector in Ireland over the past five years. With the acquisition of Navan Retail Park, Oaktree have clearly demonstrated their ability to make quick decisions with contracts exchanged within 10 days of having agreed a price. Certainty of execution is a major factor in the current market and this transaction shows how agile the team can be in terms of decision making and follow through”. Colliers international acted on behalf of the vendors. Navan is a town which had been targeted by the fund given its strong demographic profile, proximity to Dublin and significant population growth forecast over the coming years. The current population of Navan is almost 30,000 with sufficient land zoned residential to allow for that population to grow significantly over the coming years in response to the strong demand for new homes in the area. 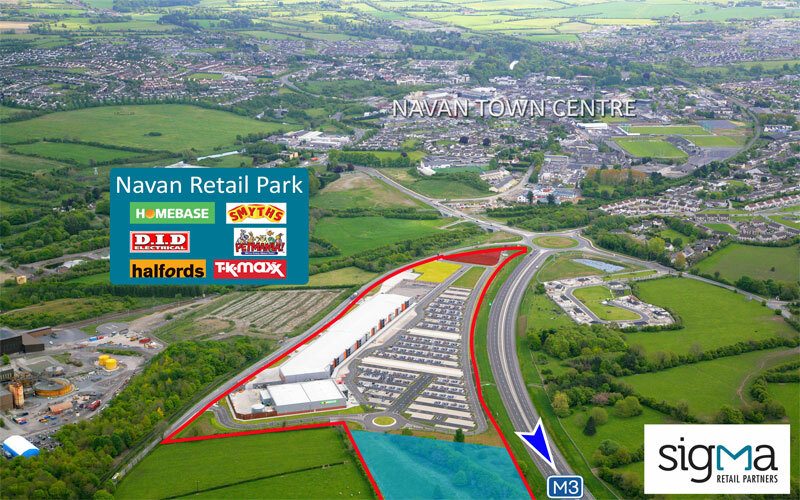 Navan Retail Park was built to a very high standard in 2007 and provides a strong mix of existing high quality retailers as well as some unoccupied units which will be made available through letting agents Bannon on a phased basis to ensure an appropriate and diverse tenant mix is achieved. The retail park was acquired with the benefit of 3.4 ha (8.5 acres) of land along with planning permission for an additional 3,000 sq m of units thus offering excellent short and medium term asset management potential to add uses such as a drive thru restaurant, coffee shop, car showrooms and a variety of complimentary leisure uses. Drive thru restaurants in particular are notably absent from Navan at present and there appears to be a significant demand for the provision of same. Existing occupiers include TK Maxx (paying a rent of 5% of turnover per annum for 1,860 sq m), Homebase (€200,000 per annum for 2,324 sq m), Smyths Toys (€135,000 per annum for 1,394 sq m) and Halfords (€149,300 per annum for 692 sq m). The arrival of TK Maxx last year was a game changer in terms of driving customer footfall to the Navan Retail Park. The park will continue to be enhanced by Sigma Retail Partners on behalf of the new owners over the coming months.